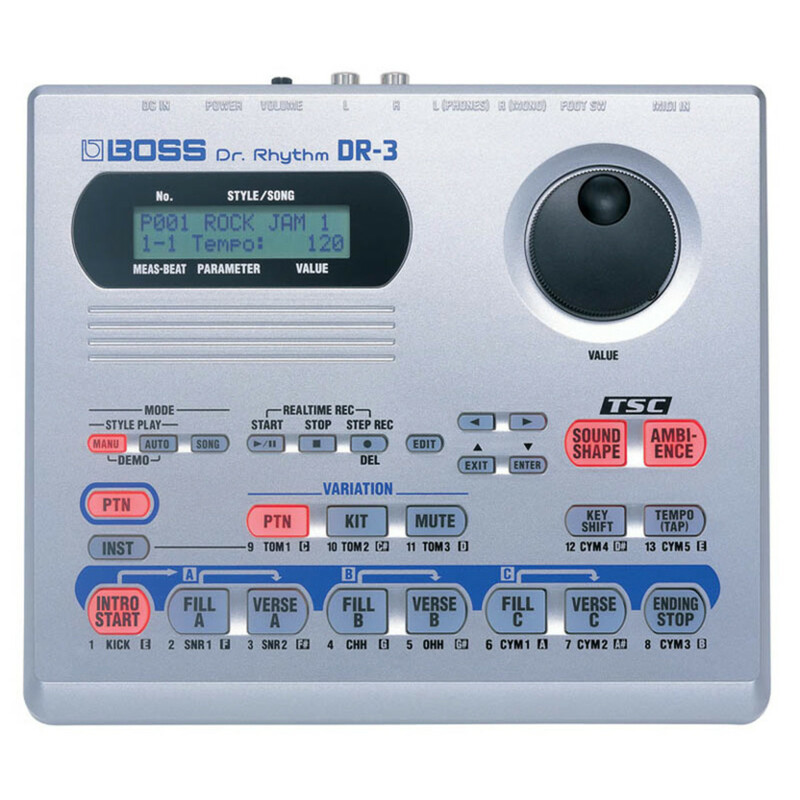 The Boss DR-3 Dr Rhythm Drum Machine is just like having your own drummer. It is ideal for any guitarist or songwriter looking to practise or jam over professional-sounding drums. The Boss DR-3 features a range of realistic drum, percussion and bass sounds, with 100 presets to get you started, all with multiple variations, allowing you to create full songs. Additionally, you can edit and create your own drum tracks with the velocity-sensitive pads in either step record or real-time mode. Ideal for anyone, the Boss DR-3 allows you to instantly get great drum sounds, meaning you won't need to go through the hassle of finding a drummer. If you're wanting to spend more time jamming than programming, the Boss DR-3 is perfect. Onboard are 100 preset styles to choose from and the eight panel buttons can be used to easily switch between different sections of your song. Boss DR-3 offers a range of realistic drum sounds, spanning over a range of genres. Additionally, the DR-3 offers up to three variations that can be selected for different sections of the song to keep things interesting. You can control and shape your sound with Boss' new Total Sound Control. This allows you to change the sound of a drum kit with specialised effects. You can adjust the 3-band compression for a punchier sound, shape your tone with the parametric EQ, or even add reverb with the Ambience effect.